The history of Niagara Falls and surrounding communities stretches back to the 1760's. The earliest residents first arrived in larger numbers with the re-settlement of the British Empire loyalists who fled from the USA. Niagara Falls was first incorporated in 1904 and was organized into a new Region in 1970 and is now part of the Regional Municipality of Niagara. Niagara Falls overlooks the 54 M (177 ft) high Horseshoe, or Canadian falls. In 1905 large-scale hydroelectric plants began operations. Sir Adam Beck No. 1 opened in 1921, has a production capacity of 498 MW and Sir Adam Beck No. 2 opened in 1954, has a production capacity of 1440 MW. In 1885 the Ontario provincial government established the Niagara Parks Commission. The orderly, landscaped quality of Queen Victoria Park gradually extended steadily along the Niagara river to the south to Fort Erie by 1915 and north to Niagara on the lake by 1931. The Niagara Region contains several attractions which include Queen Victoria Park, Table Rock Scenic Tunnels, Spanish Aero Car, the annual Winter Festival of Lights; the historical museum at Lundy's Lane, the Maid of the Mist, Marineland, Skylon Tower, Minolta Tower, IMAX Theatre, the Butterfly Conservatory, the Niagara Parks Botanical Gardens, Canada One Factory Outlets, Casino Niagara and Fallsview, the Clifton Hill Attractions and several world class golf courses. Post secondary education includes a branch campus of Niagara College (1967) and the Niagara Parks School of Horticulture. 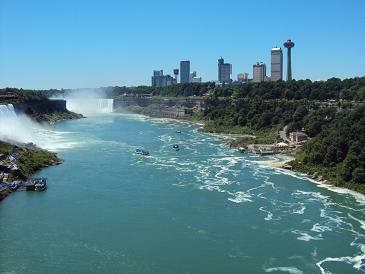 Teacher tours are ideal for ESL English teachers who want to travel to Niagara falls Canada with their class.